The 900 Series Balers are the first to use a dedicated full frame to hang all the components resulting in greater durability. All load, shocks and stress that are encountered are carried by the frame, not any individual component. On the 900 Series the bale chamber is isolated from all those constraints giving it a longer life. Less maintenance means more time available for baling. That is exactly what contractors and large farms need. The 900 Series Balers benefit from a simple design to reduce downtime. For example, the gearcase is no longer linked to the driveline by yokes. 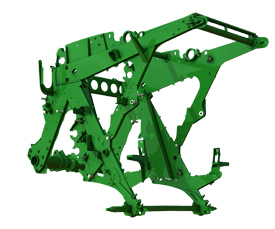 The gearcase is integrated to the frame (crossbeam design) with lubrication free bearings. Also, fewer sprockets and fewer chains limit wear and potential downtime. Six chains drive all moving parts. The 900 Series chains are heavy duty, giving up to 40 percent more durability. Chains are critical components and need a regular and efficient lubrication. 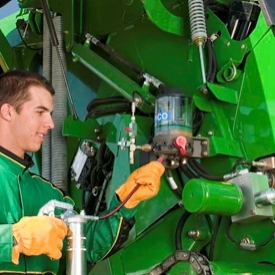 The 960 and 990 Balers offer an automatic chain lubrication pump as base equipment. 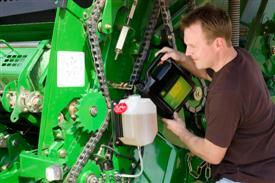 This accurate system allows independent chain lubrication settings. All chains are continuously oiled for better durability, not just during gate opening like some competitors. For best results, use environment friendly John Deere Bio Multiluber oil. Hurrying during daily maintenance can cause grease fittings oversight and potential damage. The 960 and 990 Balers offer an optional automatic greasing device. This system provides grease to bearings that require daily greasing. With ISOBUS technology, greasing parameters are easily and accurately adjusted from the display. Regular greasing gives longer parts durability resulting in better reliability. Grease tank capacity requires refill only once during harvesting season. If optional automatic greasing device is not chosen, maintenance is facilitated by grease banks grouping the grease fittings. 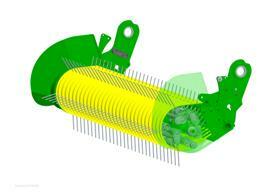 MaxD bale chamber features wide endless belts to maximize bale density and reduce crops losses. The two 571.5 mm (22.5 in.) 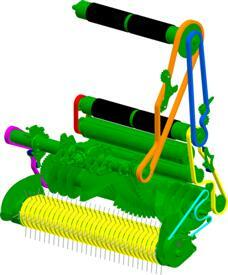 wide belts increase bale coverage by around 4 percent, thereby reducing possible crop losses between each belt. Wide belts enable an excellent bale shape and grab the crop firmly. The endless belts have increased durability at high pressure compared to spliced belts. High tension can be applied for a long time without the risk of breaking a belt, reducing the need for maintenance. 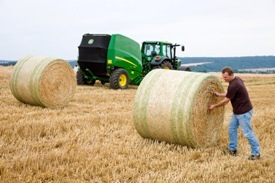 The three powered rolls facilitate bale starting, especially in wet conditions such as silage. Forage is immediately turned into the chamber and there is no slipping risk even with the heaviest bales. 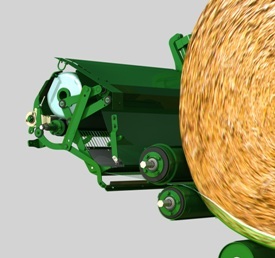 Rolls are positioned to give the bale a good round shape, regardless of the bale diameter, the core is ideally centered. As belts push crops against rigid steel rolls, high pressureis easily applied, providing high-density bales. Offset tensioning arms transmit high density. 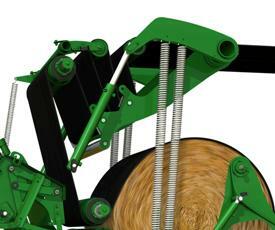 The 900 Series offers a new tension system that transmits high density to the bales. The heavy-duty offset arm gives tension to the arm and is not involved in belt length compensation. One hundred percent of hydraulic power is involved in belt tensioning. 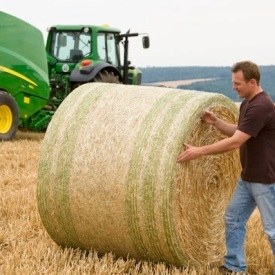 Baling silage provides tough baling conditions which can cause bales to stick in the chamber. 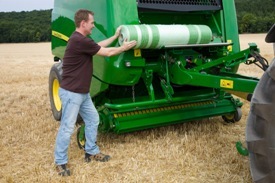 With conventional balers, density may need to be reduced so bales do not stick. The 900 Series Balers have the new MaxD bale chamber that avoids contact between bale sides and baler side sheets when unloading, an industry first. Full density can be set for different crop types. No need to decrease bale density,as the bale unloads within five seconds. MaxD bale chamber produces 1.21 m (4 ft) wide bales, which means the 900 Series provides 3.5 percent more volume than the 800 Series. More volume and more density will no doubt reduce harvest handling and shipping costs. In addition, the maximum bale diameter is increased by 50.8 mm (2 in. 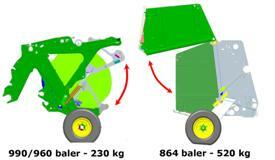 ), which increases bale volume up to 10 percent compared to the 800 Series Balers. More volume and more density reduce harvest handling and shipping costs. 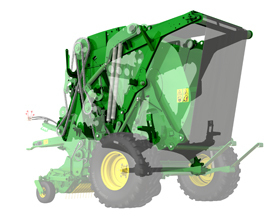 The 900 Series Balers feature a patented high-efficiency net tying system. The new design does not have traditional rubber feeding rollers that can sometime cause net plugs. A duckbill pinches the net that is directly fed between the two front rolls of the bale chamber. The net is caught by the bale and covers the bale. An exclusive knife and counter knife system ensures an accurate net cut and avoids irregular net tears. The net system is very efficient and easy to use. A tray is conveniently located on the front of the machine which allows for easy net loading.The front location also makes it easy to visually check the net applying process from the cab. The John Deere system does not require a special tool to feed the duck bill. Two hands and 10 seconds is all it takes to change a net roll. 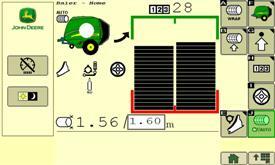 As with other John Deere variable chamber balers, all parameters (twine/net, number of turns) are quickly set from the display. In order to optimize productivity, daily maintenance for the 900 Series net tying system is not necessary. It is nearly maintenance free. CoverEdge™ compatibility gives the best bale protection. CoverEdge net offers the best bale coverage for the 900 Series Balers. This exclusive John Deere net wrap covers the bale well, overlapping the edges 51-102 mm (2-4 in.) to better protect the bale against weather conditions. 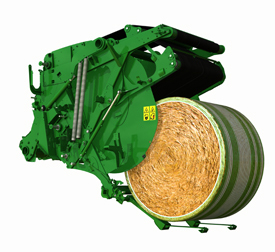 The John Deere CoverEdge net is recommended for the 900 Series Baler. However, the net tying system is compatible with most net types and brands on the market. 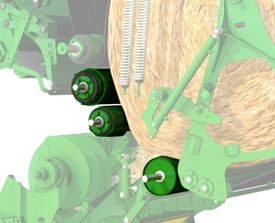 For more versatility, a new patented twine tying system has been specially designed for 900 Series Balers. Two arms efficiently feed the twine between the two front rolls in bale chamber. Tying process ends at the center of the bale where twine is cut for a great bale finish. To maximize productivity and reduce downtime, an optional storage box is available for each side of the baler. The optional storage boxes hold four net wrap rolls (two in each box). If baler is equipped with the twine tying system, the optional storage boxes hold 10 twine balls (five in each box). Unloading is unproductive time. With the FRS, the 990 and 960 Balers offer less than 5 seconds unloading time, thereby, reducing bale ejection cycle time, allowing more bales per day. Some competitors require up to 10 more seconds to unload. That means the 900 Series Balers can finish a field one hour earlier than a competitive model based on a 10-hour day. FRS provides a light structure that opens the chamber quickly and removes belts from the bale. FRS does not require a heavy structure. 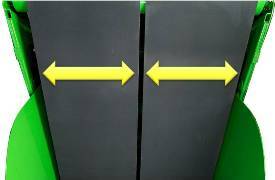 The FRS gate applies no friction to the side of the bale, allowing the bale to drop quickly unlike competitive machines. There is little stress transmitted to FRS, which can be more than two times lighter than traditional heavy gates. Opening and closing cycles are significantly faster without risk of breakage and with low power requirements. Moving sidesheets help avoid the bale from getting stuck in the chamber. When the light structure opens, each side of the chamber automatically moves two inches. Thus, there is no more contact between the bale and the chamber; the bale is released and quickly falls by its own weight. Even in the worst wet conditions, the unloading process is as efficient as in dry straw. Opening the gate on steep hills with a traditional bale may cause instability. The 900 Series offers safe unloading conditions even in hilly fields. Without a heavy gate to lift during bale release, the center of gravity hardly moves during the opening process. The global height of the baler stays low and allows ample distance from electrical wires. Rear canvas protection gives security. To prevent direct contact between operator and belts when machine is operating, a rear canvas is lowered during the baling process. 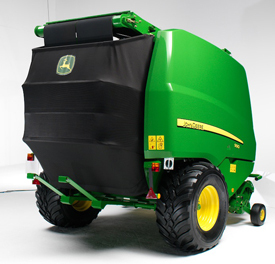 The protective rear canvas automatically rises during bale unloading. 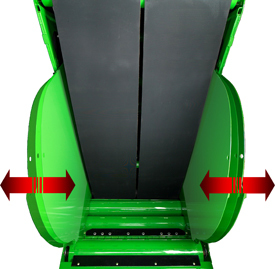 Optional unloading ramp gives a smooth and fast bale release without reversing tractor-baler combination. 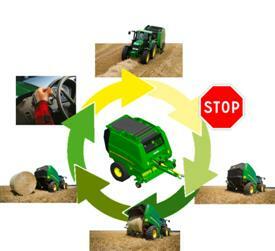 By avoiding this additional reverse move, global baler productivity is increased. With ramp extensions, there is no risk of hitting bales when closing the FRS. The 900 Series unloading ramp links to the frame by a shock absorber, allowing the bale to be smoothly discharged on the ground. With the additional spring, the ramp can quickly return and be firmly hanged in upper position during baling process and road transport, even on uneven ground. The 900 Series Balers offer a new pickup design with increased capacity. All balers are equipped with an 2184-mm (86-in.) wide pickup to match the swaths. The large-diameter strippers have five tine bars in the pickup instead of four.This increases the capacity by more than 10 percent while reducing rotating speed 12 percent, increasing reliability. Heavy-duty tine bars also provide extended durability to the pickup. 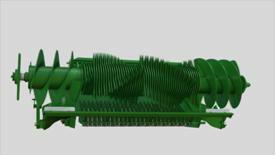 The 900 Series Balers offer huge feeding capacity due to the HC rotor design. 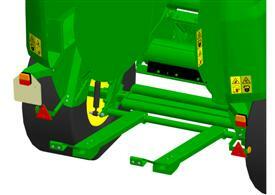 Converging augers are now integrated with the rotor limiting free space between pickup teeth and rotor. Plugging risk is reduced and crop feeding is highly improved. 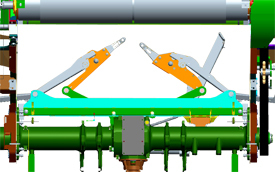 This new design along with a large diameter rotor is particularly efficient in the toughest crops or in difficult conditions, such as crossing windrows. The simple HC rotor design also reduces the number of moving parts. Loads are distributed all along the rotor increasing overall reliability. The 990 and 960 Balers are available only with a precutter, offering space between knives as short as 40 mm (1.6 in.). Crop cutting width can easily be adjusted from the cab. A single touch on the screen allows one to engage or disengage all the knives. When equipped with MaxiCut HC 25, half of the knives can also be engaged. This system offers the use of two different sets of knives for the same cutting width. For example, a set of 12 knives can be used in the morning and a second set of 13 knives can be used in the afternoon. By using two sets of knives, you will always bale with sharp knives, helping to increase productivity and fuel efficiency. This knife selection option allows for longer intervals between sharpening knives. Drop floor makes removing plugs easy, even the ones under converging augers. The new design covers all the rotor width, so wherever a plug occurs, the unplugging device allows a 40-mm (1.6-in.) free space. This space is enough to decompress the crops and feed the plug into the baler. 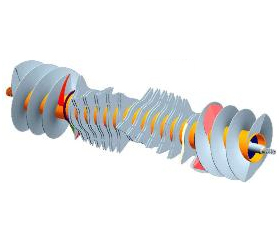 New parallel kinematics provide a consistent 40-mm (1.6-in.) space on the entire drop floor eliminating narrow pinch points like the front-hinged drop floors have. High baling comfort a single action to bale instead of four. Error proof baling - even after 10 working hours, the system does not forget any action; a true advantage for an inexperienced driver. Constant productivity - no reduced efficiency due to operators fatigue. The only action remaining is to forward reverser and manage the steering. 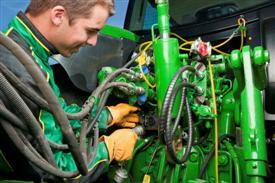 If the John Deere tractor is not equipped with IVT but has E-SCV and ISOBUS, opening and closing can be automated. A single touch on SCV, brakes, or reverser will disengage the automation. In the same way, automated open/close can be momentarily stopped when unloading in hilly conditions. Tractor-Implement Automation is an exclusive green on green advantage. 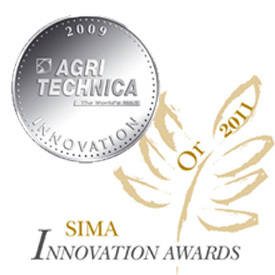 This advanced technology option has won awards at SIMA and Agritechnica farm equipment show in Europe, a true cost/value guarantee. NOTE: to run through fully automated mode, a John Deere Isobus tractor with E-SCV and IVT is required. 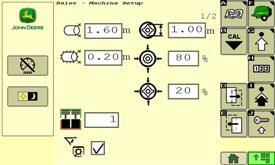 A baler activation key and a tractor activation key (different) have to be ordered. 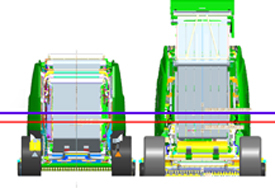 The 990 and 960 Balers offer ISOBUS compatibility as base equipment. 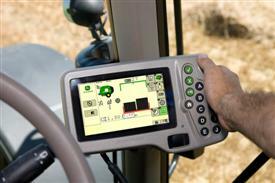 This standardized communication not only allows the use of John Deere Greenstar2 1800, 2600, or 2630 Displays, but also the use of other ISOBUS conform competitive monitors. Adapter harnesses for non-ISOBUS tractors are available. 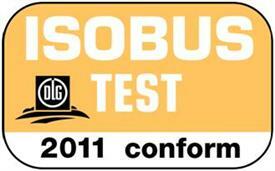 The 900 Series Balers can be teamed with all ISOBUS certified displays. 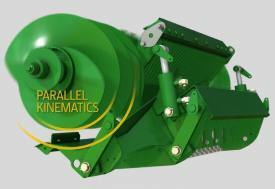 The Greenstar2 1800 monitor can be ordered with the baler to match traditional baling requirements. When not baling this display can be used for other functions such as guidance and spraying applications when connected to an appropriate receiver and implement. The 960 and 990 Balers can be ordered without a monitor for customers who already have an ISOBUS display, or for those who search more advanced application (field management). 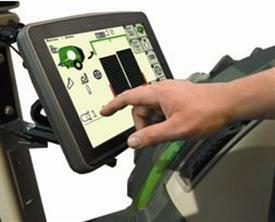 Displays other than John Deere Greenstar2 1800 can be purchased through Ag Management Solutions (AMS) pages. 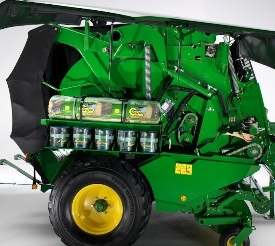 Get 0% APR fixed rate for 36 Months on New John Deere Hay & Forage Round Balers. Save an additional $750 on 450E Round Balers. Save $1,000 with the purchase of New Eligible John Deere Hay Tools or Tractors.